BEIJING, China (CNN) — A little girl and her song captivated millions of viewers during the opening ceremony of the Beijing Olympics. But what they saw was not what they heard. Games organizers confirm that Lin Miaoke [above right], who performed “Ode to the Motherland” as China’s flag was paraded Friday into Beijing’s National Stadium, was not singing at all. 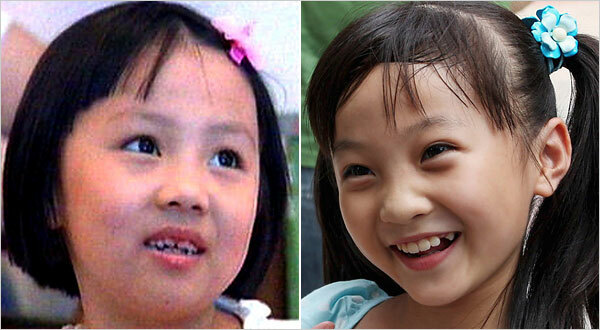 Lin was lip-syncing to the sound of another girl, 7-year-old Yang Peiyi [above left], who was heard but not seen, apparently because she was deemed not cute enough. From the Opening Ceremony, where one little girl was put on display, while another provided the voice behind the scenes, to the women’s gymnastics team, where the “16 year-old” gymnasts still have their baby teeth (despite what their passports indicate), the Chinese propaganda machine is out in full force. But what do you expect when their stated purpose is to beat the American teams in the medal count. The Chinese are certainly outdistancing the United States in gold medals, but thus far, the overall medal count is fairly close. Despite the lofty ideals, cheating always happens at the Olympics … but I would never have suspected it on such a grand scale … falsifying documents, lip-syncing … you have to wonder if there will be any doping controversies popping up for either the Chinese or for the Americans. If any Americans are busted for doping, you know that the American propaganda machine will also turn out to try to show that the American Olympians are somehow being framed by the Chinese. Like many, I am an Olympics junkie … but I’m starting to get jaded by the politics. It’s almost as bad as cycling’s brouhaha between the UCI and Amaury Sports Organisation (the organizers of the Tour de France). How bout those yankees?………oh yah, I hate baseball.